So I'll start with the most embarrassing picture first (that is one of me), I'm the one on the left. I made my shirt and waistcoat, I also have a green bodice, but sadly no picture. 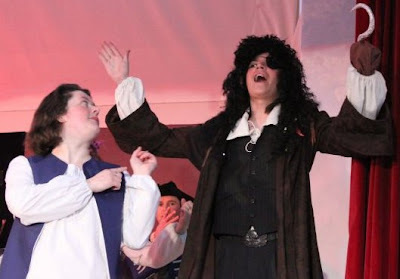 I wish I had a better picture of Long John Silver's frock coat. I also made him a shirt and cropped some old trousers to make Britches. 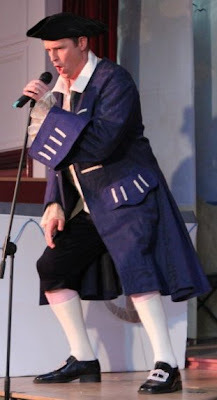 Captain Smollett in his finery, frock coat, waistcoat, frilly shirt and britches. I even made the buckles for his shoes. 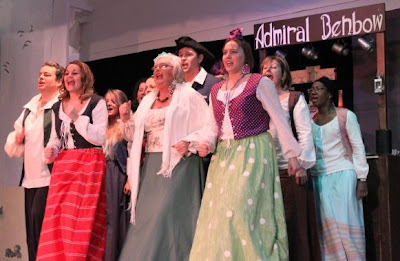 This is a strange action shot from when we sang "In the Navy", but a good shot of the costumes, I pretty much made everything you can see. 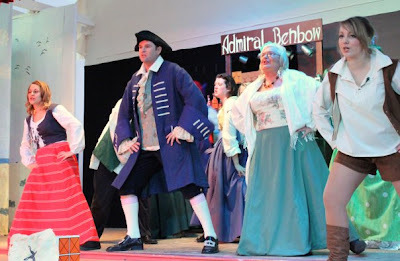 All the bodices were reversible, including Molly's on the far left whose whole costume was reversible. In the green and purple is "Dot". Everything of hers was dotty, the skirt as you can see, the bodice is purple with white dots, even the blouse's sleeves have tiny navy dots, that no one could even see. Brian was a riot of colour, this wonderful ensemble was a combination of a hospital curtain and a duvet cover. And last but by no means least "Captain Flint". This was so much work, but for three thrifted sheets it really does look great. The feet were in fact my husband's Toad slippers. and proof that I am completely nuts. 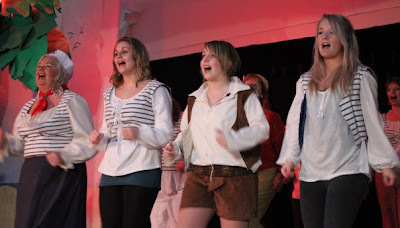 Piratical Garments for the win! 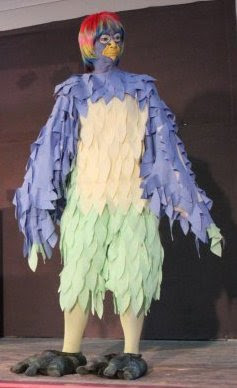 The fact that there was no budget for this project and you thrifted your material makes you a huge winner in my book. I think you did a fabulous job. Love Costumes.